I Just got the email with the pricing link attached to it from GEOcv. Without saying what the pricing is (as I don't know if he Anton wants it made public yet) I fear that they have 'missed the boat' and miss-judged their pricing model. All I know when it comes to what a Real Estate agent spends with me is this, and in this order: Photos, Aerial Photos, Day to Dusk photoconversion, video and lastly a 3D tour. I shot 1170 tours in 2018 and 75 included a 3D tour. A lot of those where giveaways when someone spent over $349 with me. No-one can argue that my price is too high as pricing starts at $99. So it doesn't matter if GEOcv offers an unlimited amount of tours/floorplans/hosting and everything else that's included if their monthly pricing is too high. I think $149 is too high so I was totally shocked to see GEOcv's pricing. So unless you are shooting an absolute boatload of tours each month, I don't think Anton's pricing model will work for most Real Estate Agent Tour Providers. GeoCV beta offering is not for everyone. We do understand that some service providers might prefer to wait for future small volume or more a la carte pricing vs our current unlimited plan. We have a limited quantity of scanner kits to distribute in short-term, which would allow early adopters to get a competitive edge. We also would like to learn from top producers and creators. Given a camera included into subscription and unlimited floor plans, starting from 15 tours per months (a tour each second day) it actually becomes cheaper than our closest competitor. We want to empower you to include a 3D tour in the majority of 1170 shoots per year, not for 6% of them. Then it would become a bargain. This could be potentially done by explicitly packaging 3D tour with photos and floor plans, and not positioning 3D tour as an add-on. Also you can start just with including only a floor plan in the package and then upsell on 3D tour, which has been already produced anyway. Agents are more likely to purchase 3D tour when they see it for their own space vs a random one. 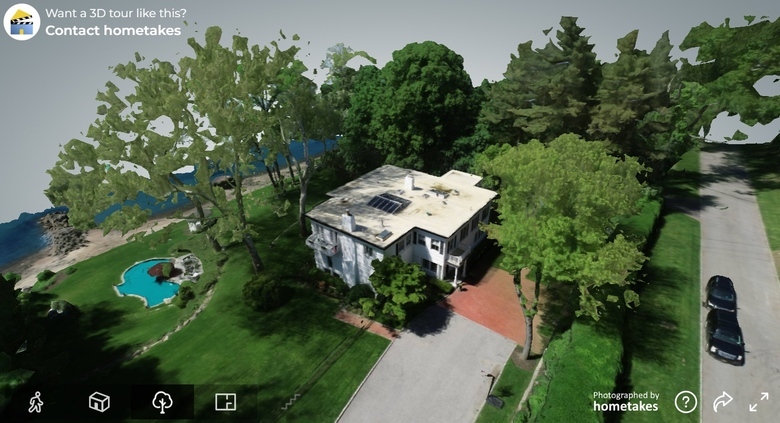 It's not a secret that margins for virtual tours service providers are squeezing. By offering control over data and viewing experience such as white labeling, branding, self-hosting, data editing, we try to help service providers to differentiate themselves and get out of this race to the bottom. Not trying to exaggerate or be offensive to anyone, but whether to be a mean to someone's else success to then become obsolete, or to invest in building the success of your own - that's a personal business choice. You know what people say about Google, Facebook and alike - if a product is free or cheap for you, perhaps the product is you (and your data) for that company. I'm new to the space... However 100% of everything we do will have a 3D tour. I come from a sales and marketing background so I can see the value. It's just a change in perspective. I will respond shortly Anton. Eating lunch now. Just wanted to quickly say, why the monthly fee per camera and not account? I could raise my prices slightly and include a 3D Tour with every shoot and afford to do one monthly fee, but not two monthly fees for two cameras. For 199 you get 13 photos 8 Video scenes and 2 drone video scenes. For me to add 3D into the mix just to cover my guys time adds another $20 to the shoot plus your fee which at your current rate would add another $20 per tour at the current amount of Tour’s I do each year. So I’d have to raise my prices $40 which would be a huge price hike for those agents that don’t like paying 199 let alone 239. I can see raising them $20 but not $40. You may want to rethink 1 fee per account, not per camera. I already differentiate myself by having a package that includes photos, video and aerial video from the local competition. The drone video being the differentiator. So I do differentiate myself and would love to take it a step further and add a 3D Tour that's included in all packages. There was one huge thing I forgot to say in my last post. Aside from raising my rates $20 to cover the cost of the additional labor, I forgot that I didn't build in a profit for me or a GEOcv fee. If I were to shoot the same amount of tours this year (1170), I'd be happy to profit $1.93 per shoot for adding 3D to all of my tours (making me an additional $2258 profit). $1.93 you say, why that number? Because $3.07 per tour is what it would cost me if I were paying $3600 a year to GEOcv based on 1170 tours. $1.93 to me + $3.07 you is an even $5. Add that to the extra labor cost of $20 for the photographer and that's a $24 raise in price for me to add a 3D tour to all of my packages. I don't think I would lose too many customers raising them from $199 to $224 (my current lowest price package). So if GEOcv's revenue stream was $300 a month for an unlimited plan, that's $3600 per year. That is more than Matterports revenue stream from me which is: $1788 per year (12 x $149). Will all due respect, don't let greed get in your way (sorry, but your pricing just comes across that way). You have to remember, for you to see a future of every tour operator doing a 3D GEOcv tour, they can't raise prices on their clients by much. As you mentioned, only 6% of customers are choosing to do them so if we are going to mandate them into their package tour, that cost has to be minimal. I can see many of my customers telling me, I don't want one, just charge me the $199 you've always charged, I don't need any more than what I am already doing for my client (photos and video). I just can't see why if your revenue was $3600 (per tour operator) isn't enough for you. Just my two cents on this discussion. It is either COST or sharp DIFFERENTIATION. Or, and this is where the magic happens sometimes, by offering a DISRUPTIVE BUSINESS MODEL. If the new entrant produces something that is similar to the incumbent or, tries to be better in dimensions that are not the ones its potential customers will value as important, then he/she should consider his/her business model. If the new entrant offers a complex value proposition, such as: "this is a little more expensive but I give you more of x, or more of Y", and if X or Y are not as valuable for the market as the new entrant thinks, then he/she will fail. In a niche market, particularly when you have to keep up with continuous investments to keep innovating and stay ahead in the frontier, you have to become a disruptor, because there is no place for many competitors. It is very difficult (I would say improbable) that a Matterport Service Provider will embrace any new technology unless there is a considerable and tempting bait. The trick is to find what kind of bait the MSP are willing to grab. Anybody willing to suceed in this market should read all the posts in this forum and try to understand what is that the market really want. I don´t know GEOcv technology and value proposition in detail so please take my post as a contribution from my expertise as a business strategy consultant with more than 20 years of experience. I am semi retired in this Matterport thing nowadays due to market conditions in Argentina, although I have my camera ready and do a scann or two per month, sometimes a pro bono thing for a school or a church, but I still read the forum because it is a very rich source of information and business intelligence. My piece of advice to anyone trying to enter in this market....Don´t imagine, read! All the best to this wonderful community and keep scanning! Yesterday (Tuesday, 5 February 2019), I spoke with a busy, successful US real estate photography agency in a major market whom planned to move forward with the GeoCV beta offering. Like @hometakes, his agency was an early adopter of Matterport. In our discussion, pricing was irrelevant because GeoCV provides a solution as good or better than Matterport AND makes Matterport irrelevant on ALL the points listed above. I have read all GeoCV posts in the WGAN Forum. Anton has been clear that he seeks a limited number of beta testers among busy, successful real estate photographers that value the differentiators noted above (and likely will have other pricing options in the future). His goal is to work within his “super-sweet spot” first. Respectfully, while it is insightful to read your detailed pricing analysis, it is also apparent that, initially, it’s unlikely that you are in Anton’s “sweet spot” for the initial beta testers - early adopters - because in your pricing analysis, you value all the above differentiators as zero, since you have not factored any of them in the equation. It’s clear that Anton has chosen option b) A much, much better product/service (to compete on points where it makes Matterport irrelevant for busy, professional photographers that value the list of sharp differentiators above: a disruptive business model. In my mind, the reason that you should participate in because of your PhotoAndVideoEdits.com business. I could imagine that Anton is already thinking ahead to third-party integrations and your photo and video editing business would be a great value-add to the GeoCV ecosystem. Getting first-hand experience with GeoCV for your @hometakes business - and beginning a relationship with Anton and his team would help you think through where PhotoAndVideoEdits.com could be seamlessly integrated into the GeoCV platform. It’s obvious to me that Anton - and his team - have been reading every discussion in the We Get Around Network Forum – for all the ways that Matterport Service Providers – and all professional photographers that are considering Matterport – would switch to another camera/platform. GeoCV has nailed it with a 3D Tour platform that is equal or better than Matterport mashed up with a disruptive business model that makes Matterport irrelevant. It's a David versus Goliath story worthy of binge watching on Netflix. While I appreciate the work that GeoCV has done on the development of their product, I agree that the beta pricing is WAY out of realistic range for most markets, especially seasonal ones like we have here in South Florida. Less than 0.004% of all listings in our area had virtual tours in the last quarter. Realtors listed "high cost" followed by "Privacy Concerns" as the top reasons they did not adopt virtual tours for their listings. In a lot of cases, the sheer number of service providers in major markets here has cut the ROI so much that it is nearly impossible to recoup the initial investments. When asked what price point they would expect to pay for virtual tours on a 2500 sq ft home, realtors responded overwhelmingly, "under $150." The same survey from a year prior to the response was, "between $250-300." Times are changing. The service offerings from GeoCV are impressive, and the value can't be understated, however, at least in a beta period, the "benefit" of early adoption might not warrant the cost associated with it. With all its faults, one advantage of early investment in Matterport was the ownership of the equipment, which had a deductible value and resale value. We don't see this with the GeoCV system. I would be curious to see if they offer cameras setups for sale in the future. Offering a "free" camera that ultimately costs significantly more than the Matterport investment because it is built into the price of the service is a little misleading, but I get what they are doing. The should just call it a "rental" and put a value on it. Of course, there are market exceptions, like New York or Los Angeles where this might do very well in the beta period, but I think a majority of markets could not support services with such a high overhead initially. The rest of the real world is not New York, so like many, I will wait to see what they offer in the future. I imagine it will be competitively priced and take into consideration the constantly shrinking margins. Otherwise, this might just fizzle before it starts... which would be unfortunate. How did you get this e-mail with GeoCV pricing? I couldn't find it on their website and I am interested on it. Studying about it and the new Matterport support for 360º cameras. You have to apply through their website and if approved, you will get the email. Sorry, they ask not to disclose so I can’t say how much. Either way the GeoCV solution is not set in stone. What happens if they lose against Matterport? More than likely Matterport will buy GeoCV intellectual property and either implement it n future Matterport solutions or hold it for future development, or kill it all together. And eventually Matterport might be sold to Google or Facebook, who knows? All I know is that Virtual Reality will only boom in the next decade. GeoCV Hidden Cost: Time to scan. GeoCV High Cost Benefit: It's like buying a franchise. I can see how one could differentiate themselves in a market when they are the only person offering this. The list of 'pluses' that Dan has listed are likely to be attractive to clients too. Therefore, the high cost of entry may pay for itself if marketed correctly. Why would Matterport listen to Anton's input? Why would Anton give Matterport input? I spoke with a busy, successful US real estate photography agency in a major market whom planned to move forward with the GeoCV beta offering. I'm just really not sure what company at Matterport's scale, implements change to a large platform based on unsolicited feedback. I give Matterport a lot of feedback. I have been championing them bringing back the OBJ file (a lower quality version) as well as allowing panorama downloads at a price. I made a presentation to them on June 1 2018 where I pitched 60 ideas. I was well received and listened to. My #1 suggestion was to take 360 Placements and bury them in an unmarked grave. Since then, I have contemplated how realistic it would be to see my requests take shape. I'm thinking that the ideas were discussed and maybe they might be revisited down the road (people got print outs!) Maybe I delivered a good idea. Maybe not. In the meantime, what I am THRILLED about is that they have an SDK! Many of my ideas can be implemented all by myself without them having to complicate their system with niche tools! I cannot complain as I've been super busy for the past YEAR building features to extend Showcase. I'm presently lobbying a few very simple ideas for Capture 3. Super simple, big impact. I am REALLY hoping that these ideas come through. I've seen several references to a "free" camera being included in the Geocv plan. The info they sent me, indicated the that the camera had to be purchased in addition to the plan. Its hardly an accident when a company posts its pricing link. I'm wondering why they took it down shortly after it was posted? We're currently in BETA, we learn from early adopters to establish the best pricing going further, so due to changes during this interim process we don't publish the pricing yet, but we'd be happy to provide upon request at sales@geocv.com and discuss what works best for everyone. I had already emailed them and received the PDF with the pricing. I was not told that I could not share the pricing. But, based upon the other posts, I guess it is "secret". That doesn't exactly instill confidence in a company. I am guessing that some applicants have been offered different pricing and possibly included hardware. As someone that has been in business for over 20 years and is looking at adding virtual tours to a project the GeoCV business model seems a little strange. I get the impression you are paying a premium to be a "Beta Tester". I've seen the post that they are geared towards users that shoot 1000+ tours a year. My concern with that business model would be longevity of the company. If their only growth opportunity is the conversion of users of similar products, it will be a short life. I just read the new post by Anton: his need to Keep the prices private and issuing the prices only after you submit how many tours you shot last year and how many you project to shoot this year, smacks of preferential pricing. I won't be commenting on speculation. During a long time we've shown that we try to be as transparent as possible, so if I say we don't share pricing publicly because we want to learn from our potential customers how to structure pricing properly in long-term, I believe I've deserved to be believed without any conspiracy thoughts. We could easily be in stealth mode like many other startups do, but this is not our approach to be an open platform. So if something is not open yet, this is for a good reason and in the best interest of current and future customers. I am not attempting to insult anyone. Many years ago I was a beta tester for Microsoft, as beta tester I received free or discounted software in exchange for honest feedback. I have never heard of beta testing retail pricing. Is there a possibility that if I purchase your all-inclusive unlimited plan that I will see it offered at a lower price in the near future (based upon user feedback)? I joined the forum as I was looking for information on the Matterport product before I make a purchase. the forum has been a great source of information. I joined a no-cost beta test from another manufacturer after reading about it here on the forums. I've done a lot of aerial imaging using drones and read on here that GeoCV was implementing drone technology into your product. I thought well that could be a great reason to buy GeoCV. But, according to the PDF it is not incorporated and has to be ordered a per project basis. I'm not an expert but I've been in business for over 20 years. I know that you can always lower a price that is slightly too high for the market. It is extremely difficult to raise a price if you undervalue your product. But, if you value it so high that it creates "sticker shock", the damage can be critical. One of the things I have learned from following this forum is that the market for tours may be increasing, but the retail pricing is decreasing. Which is a normal path for new technology. The question regarding the free or included camera has not been addressed? @homefinder3D. IMHO, pricing is really simple. Offer more features than your competition offers and do it at a lower cost. It's not rocket science so don't treat it like it is. Or am I missing something?